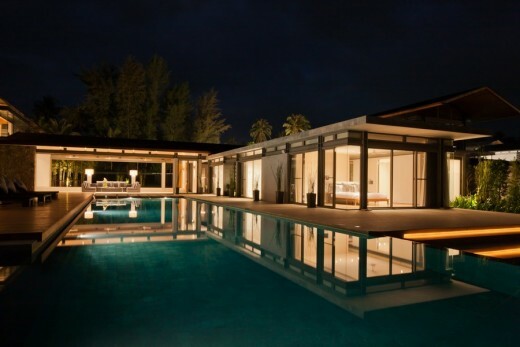 The client’s brief was to create a six bedroom dream villa on a prime beach front plot of land on the west coast of Phang Nga province at the southern end of Thailand. The house was to be open and spacious with extensive decks, terraces and lawns and specifically designed so that it would be ideal for two families visiting at the same time. Aside from the spectacular view, an added element was to be a 25m swimming pool that has now become one of the principal features around which the house is laid out. 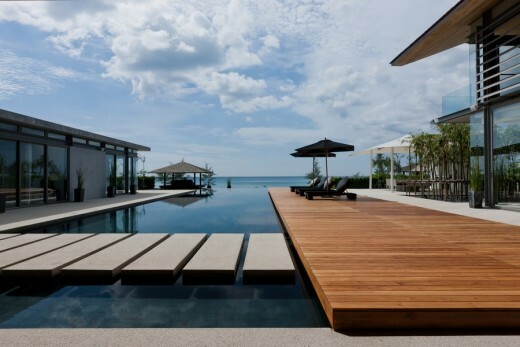 The design evolved to focus on the view and the central swimming pool. 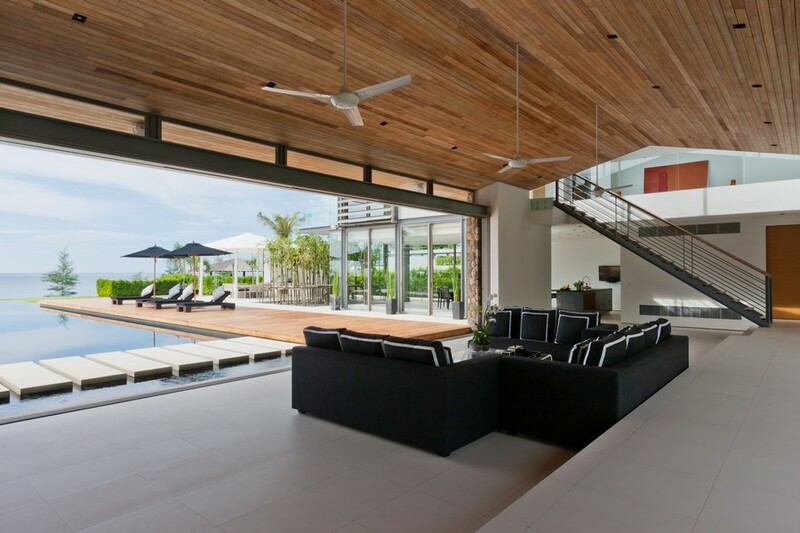 The main living area is positioned at one end of the pool and can completely open up, front and rear, allowing the almost constant monsoon breeze to cool the space and draw air from the other rooms in the house. The bedrooms have been located in two wings, with three bedrooms in each, to accommodate the need for two families. The dining, kitchen and staff accommodation are under the northern bedroom wing. The overriding concept has been to create a dynamic, contemporary vacation home that is a world apart from city life. The central living space has become the heart of the home with doors that pocket into the adjacent walls to create a fantastic feeling of openness. The main entrance is through this space and access to all areas of the home, whether indoors or out, is via this pivotal area. The client’s desire for a dynamic, contemporary, tropical villa, that feels open and exciting, has been fulfilled in a composition that embraces the local climate and a free and easy vacation lifestyle. 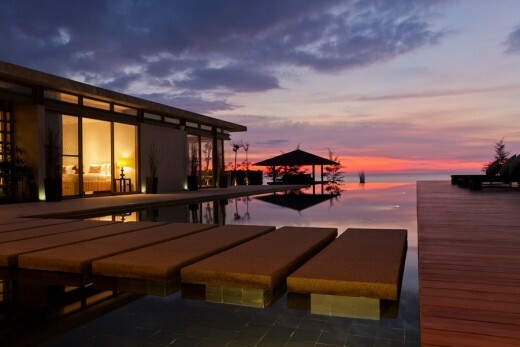 Villa Sava is located on the beautiful Natai Beach on the west coast of Phang Nga province in Thailand. At a latitude of 8° north, it enjoys a tropical monsoon climate with wet south-westerlies from April to November and dry north-east winds for the remainder of the year. 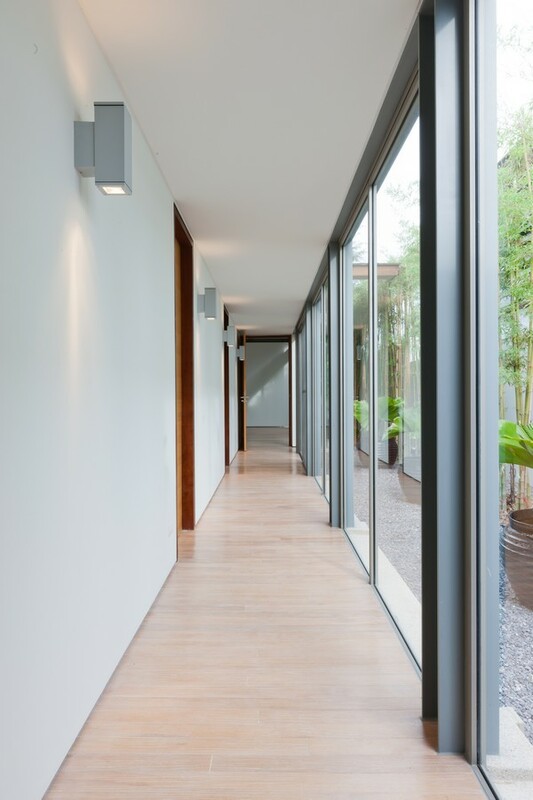 These near constant breezes are the driving force behind the open living space, where the monsoon winds naturally cool by drawing air through the rest of the house. Regulation set-backs have been a benefit as there is a large lawn area between the pool and terraces and the sandy beach. Villa Sava has been built on a green field site and is part of a development of other similar homes by the same architect. Previously, there were no other buildings in the vicinity that is 10 minutes by car to the nearest village. Notwithstanding this isolation, the design has used materials that whilst being modern in their usage, have referenced the local vernacular. This has softened the aesthetic of the design and made them a very comfortable contemporary. The house sits very comfortably on this essentially flat site. Activities are focused around the swimming pool and the set-back from the beach make it unobtrusive from the waterfront. 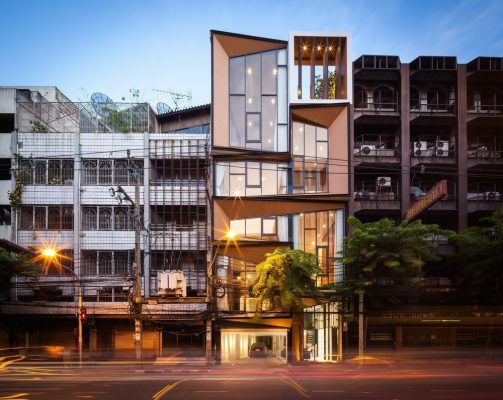 The design tries to be unimposing belying its 800m2 floor area. The floor plan of Villa Sava have been designed with two wings connected by a perpendicular element. Water also plays a significant role with a reflection pond at the entrance continuing as the major swimming pool element on the other side of the living space. The south wing is single storey and has a large family room along with a three bedroom suite comprising a Master Bedroom and two Guest Rooms. The north wing is two storey with a second three bedroom suite along with second Master Bedroom on the first floor below which are a large dining area with an open presentation kitchen to the front and the main production kitchen, utility area and staff accommodation behind. 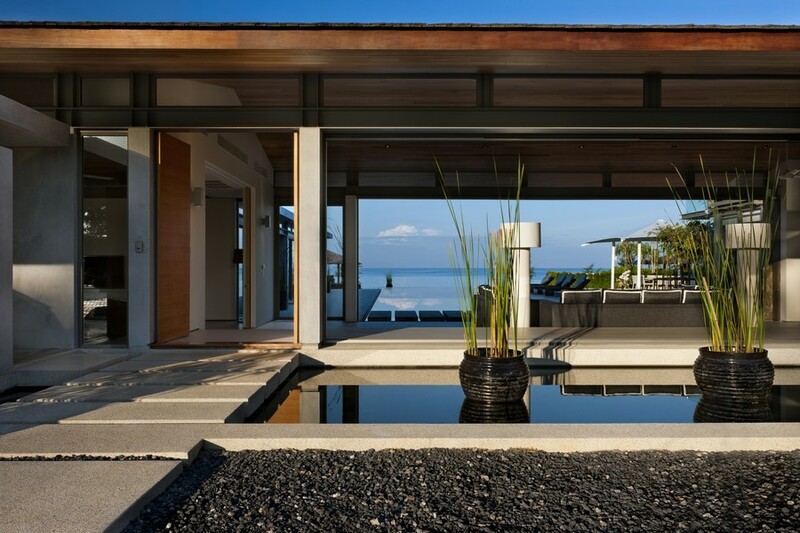 In the gardens there is a BBQ Sala with full outdoor kitchen and sunken dining table, a Beachfront Sala for lounging and a boathouse. Each of the dual Master Bedroom suites have similar layouts. The main bed areas have central king-sized beds with desk and walk-through closet behind. Both suites have stunning views out over the beach and the Andaman Sea beyond. 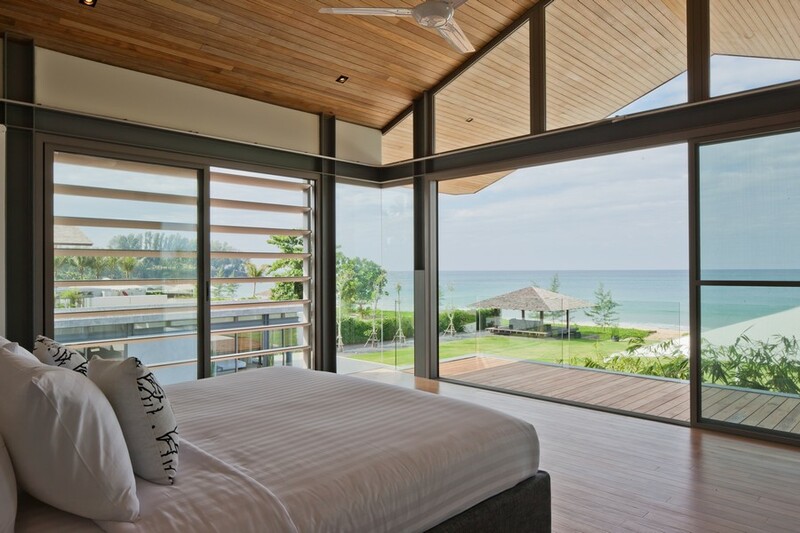 Privacy for the bedrooms is enhanced by operable elliptical aluminium louvres. These work in panels that have become defined by the elegant steel structure. Floor and ceiling finishes are both in bleached Tabac wood and help to soften the otherwise matalic aesthetic. Adjacent to the Master Bedrooms, their ensuite bathrooms are all 5 point with twin basins, separate shower and spa bath and enclosed WC. The materials are simple but complimentary with homogenous ceramic tiles on the floor and bath contrasted with cement render on the walls. The timber to the vanity units softens the composition in much the same way as the floors and ceilings in the Master Bedroom. As mentioned earlier, the materials have been selected to reflect those found in the local vernacular. These have been supplemented by more contemporary finishes to form a harmonious palette. – Bleached Tabac strip flooring and ceiling. – Powder coated aluminium . – Natural riven slate pond and pool tiles. – Low energy lighting used throughout. – Low-e glass to windows and doors. 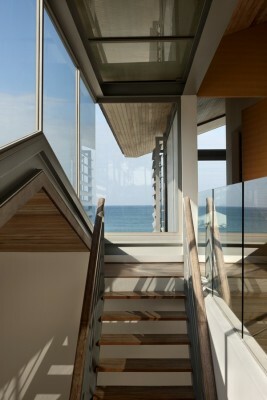 – Natural ventilation encouraged by large openable windows and doors. – Low energy air conditioning. – Dual flush toilet systems. The main natural cooling system afforded by the extensive use of pocket doors and windows is powered by the wind. The following sustainable materials and systems have been used . – Salt water swimming pool. – Local renewable Tabac wood for ceilings and floors. – Locally quarried slate tiles. – Indigenous landscaping used to reduce water usage. – All cabinerty produced locally. A high-tech lighting system helps control the low energy LED and fluorescent lighting design. This along with low-E glass are innovative technologies that help the sustainability of the home. Smoke alarms are located in every room with a heat sensor being provided in the kitchen. Fire suppression is provided for with individual fire extinguishers strategically located throughout the house with the addition of a fire blanket in each kitchen.